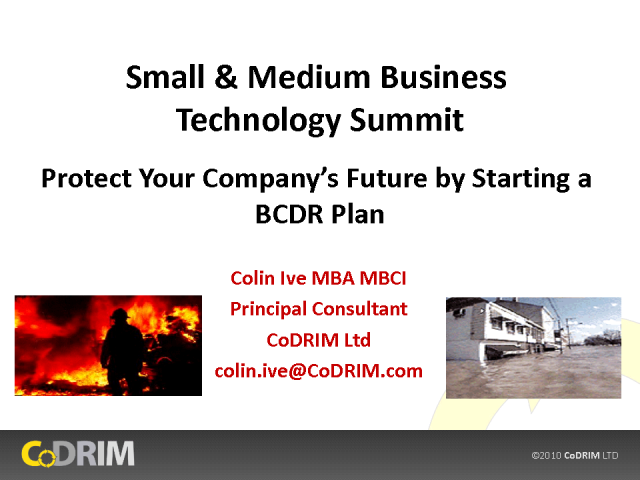 Colin’s unique and significant assets of knowledge and experience in the importance of Disaster and Business Continuity Management were gained in over 30 years of business. Combined with 26 years as a fire officer commanding a busy fire station in England, where he managed disasters on almost a daily basis until his retirement from this role in 2006. Following the completion of his MBA in 2001 Colin became the Chief Risk & Continuity Manager with global responsibility at Nokia. During his time in this business critical role he introduced and established many of the BCM processes and procedures essential to a global business with one of the most recognised brands in the world. This knowledge and experience has enabled him to become a leading practioner of Business Resilience. A Member of the Business Continuity Institute and qualified Lead Auditor for ISO9001 & BS25999 he is an ‘in demand’ presenter at many European and USA Business Continuity and Business Resilience Conferences. He was a contributing author to the BCI Good Practice Guide for Business Continuity Planning and is a published author in his own right.